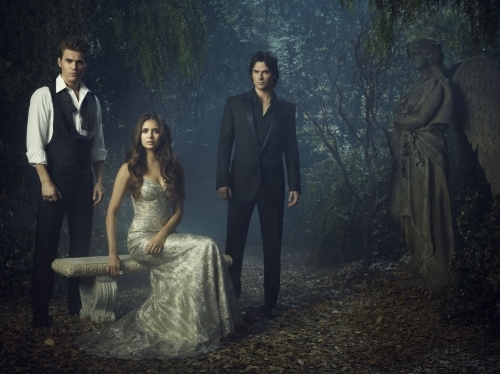 Even if I'm 24, I'm still a fan of The Vampire Diaries and I can't wait for next thursday ! I'm looking forward to see Elena as a vampire and Klaus in Tyler's body (crazy sauce right ?). I guess the reason why I love TVD so much is because it reminds me of my craziness over Buffy The Vampire Slayer when I was a teenager. Back then I was obsessed with vampires and the impossible love between Angel and Buffy. I was a MAD fan of that show ! Pictures all over my bedroom, collecting them in magazines, even writing fan support letters to the actors,... well I was 13 so that explains a lot ! lol Now being 24 I'm obviously not gonna do that but I still enjoy a good vampire show ! Season 4 is gonna rock ! Especially for Delena (Damon/Elena), it's the beginning ! Don't be mad if you're a Stelena (Stefan/Elena) fan, every couple deserves a shot and that show is based on the love triangle. ANYWAY ! I'm gonna stop making myself looking like a crazy 14 year old girl and let you watch the tutorial and see the list of products ! So are you team Damon, team Stefan, or none of them ?